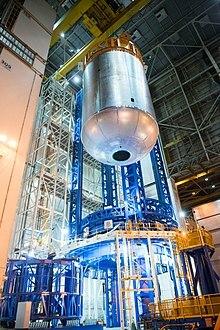 The Michoud Assembly Facility (MAF) is an 832-acre (337 ha) manufacturing complex owned by NASA in New Orleans East, a district within New Orleans, Louisiana, in the United States. Organizationally it is part of NASA's Marshall Space Flight Center, and is currently a multi-tenant complex to allow commercial and government contractors, as well as government agencies, to use the site. MAF is one of the largest manufacturing plants in the world with 43 environmentally controlled acres—174,000 m2 (1,870,000 sq ft)—under one roof, and it employs more than 4,200 people. From September 1961 to the end of the Apollo program in December 1972 the site was utilized by Chrysler Corporation to build the first stages of the Saturn I and Saturn IB, later joined by Boeing Corporation to build the first stage of the Saturn V rockets. From September 5, 1973, to September 20, 2010, the factory was used for the construction of the Space Shuttle's external fuel tanks by Martin Marietta Corporation, Denver Colorado. The facility was originally constructed in 1940 at the village of Michoud, Louisiana, by the Higgins-Tucker division of Higgins Industries under the direction of Andrew Jackson Higgins. Construction was done on behalf of the United States government for the war production during World War II of plywood C-76 cargo planes and landing craft. The project cost $180 million ($2.8 billion in 2018). During the Korean War it made engines for Sherman and Patton tanks, and boasted a 5,500 foot paved runway. It came under the management of NASA in 1961, and was used for the construction of the S-IC first stage of the Saturn V rockets and the S-IB first stage of the Saturn IB rockets built by Chrysler Corporation. It is home to the first stage of the last-constructed Saturn V, SA-515, built by Chrysler Corporation and Boeing Corporation. 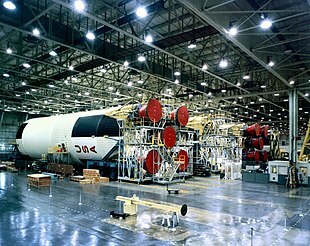 The factory's ceiling height limitation - 12 meters, was unable to allow the construction of the bigger C-8 direct Moon vehicle, was one of the major reasons why the smaller C-5 (later renamed Saturn V) was chosen instead of the originally planned Moon vehicle. The majority of the NASA factory's history was focused on construction and production of NASA's Space Shuttle external tank (ET). Beginning with rollout of ET-1 on June 29, 1979, which flew on STS-1, 136 tanks were produced throughout the Space Shuttle program, ending with the flight-ready tank ET-122, which flew on STS-134, rolled out on September 20, 2010. A single tank produced at the facility, ET-94, was not used in spaceflight and remained at Michoud as a test article. Modular parts for the International Space Station were fabricated at the facility in the mid 1990s until 2010. A section of eastern New Orleans after Hurricane Katrina. MAF (green) is not flooded, while the surrounding neighborhoods (dark greenish brown) are extensively flooded. The facility did not experience significant flooding during Hurricane Katrina due to a natural ridge that runs along its northwestern boundary, the levee that makes up the southern and eastern boundaries, and the work of the pump operators who stayed to protect the facility during the storm. There was wind damage and rainwater damage to several buildings. All shifts were initially canceled up to September 26, 2005, potentially setting back future Shuttle flights. All the buildings and the shuttle hardware within survived the hurricane without grave damage, but the roof of the main manufacturing building was breached and debris damaged ET-122 stored inside; that tank was refurbished and later flew on the final flight of Space Shuttle Endeavour, STS-134. Thirty-eight NASA and Lockheed Martin employees stayed behind during Hurricane Katrina to operate the pumping systems, knowing that if not activated and sustained, the facility would have been destroyed. The workers pumped more than one billion gallons (3,800,000 m3) of water out of the facility and probably were the reason that the rocket factory suffered very little damage. These employees were each awarded the NASA Exceptional Bravery Medal, NASA's highest bravery award. On September 16, 2005 NASA announced that the repairs were progressing faster than anticipated, and so they would continue to use Michoud for external tank work. On October 3, 2005, the facility officially reopened for essential personnel, though some key personnel had returned earlier. On October 31 the facility reopened to all personnel. On February 7, 2017, an EF3 tornado carved a path through Orleans Parish, in which the factory is located. Two major buildings including the main manufacturing building were damaged, with multiple broken windows. 5 people were injured, and resulting repairs and other factors contributed to the delay of the first SLS launch until 2019. Building 1 comprises the main manufacturing building (Building number 103), and the North and South Vertical Assembly Buildings (Building numbers 115 and 110 respectively). The North VAB was constructed in 2011, initially to add new vertical welding equipment. The main manufacturing building is where the majority of preliminary fabrication and welding activities take place - the Space Launch System core stage (and previously the Space Shuttle External Tank and Saturn V first stage) were manufactured. The building stretches 512 by 340 meters in dimensions, and contains over 40 sub-areas for different manufacturing and structural assembly operations. A series of internal roads made from polished concrete provide ease of access by factory vehicles, trams, and overhead cranes to move components around. They run the whole length of the factory building. Factory floor office buildings and engineering rooms are located in various ends of the main manufacturing building. Near the South VAB is an electric arc furnace and casting equipment. In front of the main manufacturing building is the administration offices, lobby, restaurants and engineering conference rooms. There is also a gym, retail stores, media lab, a medical area and a large cafeteria provided for the workers. Facing north is a factory floor museum display area, with mission patches, flags and memorials. Building 2 is an external building that is used to manufacture smaller components and space station equipment, for example small components for the International Space Station. It also supplies various small components such as fasteners to the main building. Building 3 is another external building for various manufacturing processes, and contains a laboratory, office space and technical storage areas. Building 3-20 is the employees dormitory building, and contains a restaurant and offices. Building 4 is located south of the complex. It is an industrial workshop for the processing and application of spray-on insulation foam to SLS tank components. Space Shuttle external tank spares were also housed there. Adjacent to the main manufacturing building are more foam application workshops, power transformers for the arc furnace and other facilities, and large amounts of open space. In front of the South VAB, rocket parts are moved from this building to the side internal workshops across the plaza for inspection and checks. The SLS core stage test simulator (made of steel) is also located in this area. The National Finance Center (NSF) - located west of the complex; houses offices for the U.S. Department of Agriculture, and contains several large conference rooms, a restaurant and a ballroom for NASA employees and visitor events. The shipping port is located 600 meters southwest of the main manufacturing building. Transporting vehicles carrying manufactured SLS components move down Saturn Blvd, past large open fields, to the pier - where the Pegasus Barge is docked. This is where the components are shipped to their final destination - Kennedy Space Center, or rarely back to the main Marshall Space Flight Center in Huntsville, Alabama. The Michoud Assembly Facility also houses other organizations such as the National Finance Center operated by the United States Department of Agriculture, the United States Coast Guard, Blade Dynamics, the Chris A. Hadfield Rocket Factory, Lockheed Martin and NASA. The factory is now the location for the Space Launch System (SLS) being built by the Boeing company which will be the most powerful rocket in the history of spaceflight. It will carry the Orion spacecraft during its first launch to prove capabilities. Launch is set for early 2019. The factory complex is open to public visitation, visitors need to sign in at the main reception and clear security. NASA planned to use the rocket factory to build the structure for several components of the cancelled Constellation program, including the Orion spacecraft, the Ares I Upper Stage, and the Ares V Core Stage. Under the Obama administration, the Constellation Program was cancelled in 2010, but was replaced with SLS a year later to continue space exploration efforts. NASA has an agreement in place to rent out a portion of the facility to Big Easy Studios, a New Orleans film studio. This deal as been criticized by competing studios as violating NASA's rule that any deal with an outside entity must serve the agency's mission and must not compete with the private sector. NASA officials defend the agreement, stating that this helps to offset the cost of unused space on the facility and that their pricing is vetted by state and local economic development agencies to ensure it is not competing with the private market. Portions of Ender's Game, G.I. Joe: Retaliation, and Dawn of the Planet of the Apes were filmed at the factory. On May 24, 1988, TACA Flight 110 operated with a Boeing 737-300 jetliner made a successful emergency landing on a grassy levee in the Michoud grounds after power was lost in both engines during a severe thunderstorm. The aircraft was towed into the Michoud facility, where its engines were replaced. On 6 June, it took off, with a crew of two and minimal fuel, using the former runway at Michoud, which had been reused as a road, Saturn Boulevard. It was flown the short distance to New Orleans International Airport, where it was repaired. Over the years, several reported incidents of robbery and terrorism occurred at the facility; where trespassers on numerous occasions have been known to break in and have stolen technical paperwork. As a result, public visitors and employees taking photographs inside is highly regulated by NASA officials. There was a recent bomb threat to MAF; and after 9/11, double-perimeter security fences were installed in 2007-2008. At the same time, all of the front windows of the administration offices were upgraded with black-anodized shatter-proof transparent panels. EFT-1 Orion after final weld on June 22, 2012 in the Main Manufacturing Building. ^ "Jacobs Technology". Jacobs Technology. Retrieved 2018-01-11. ^ Curtis Redgap. "Fly Chrysler to the Moon: the Saturn Rockets". Allpar.com. Retrieved 2014-05-14. ^ a b Dean, James. "Michoud Declares End Of External Tank Production". Florida Today. Retrieved 30 September 2010. ^ Sloss, Philip (22 September 2010). "MAF speak of their pride in returning ET-122 to the Shuttle manifest". NASASpaceFlight.com. ^ Tank ET-122 ended up being the last, even though its sequence number was lower than the total number of tanks produced, because it had been damaged during Hurricane Katrina and required repairs prior to completion. ^ "NASA Administrator Honors Katrina Heroes" (Press release). NASA. 2006-01-05. 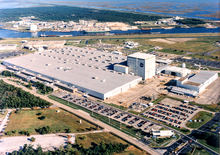 ^ "NASA Planning to Resume Work at Michoud Assembly Facility" (Press release). NASA. 2005-09-16. ^ "Workers Repair Roof Damage to NASA's Rocket Factory | NASA". Nasa.gov. 2017-02-07. Retrieved 2018-01-11. ^ Dan Billow (2017-02-08). "NASA rocket factory damaged by violent winds". Wesh.com. Retrieved 2018-01-11. ^ David Jacobs (2012-09-17). "NASA defends deal with N.O. film studio". Greater Baton Rouge Business Report. Archived from the original on 2014-05-15. ^ Jim Cheng. "Ender's Game filmed at NASA Michoud Assembly Facility" (Press release). ^ "'G.I. Joe' film crew member killed on set in New Orleans". NOLA.com. 2011-11-23. ^ a b "Emergency-shortened flight is completed". UPI. June 6, 1988. Retrieved 2 July 2018. Jerry E. Strahan (1998). Andrew Jackson Higgins and the Boats That Won World War II. ISBN 0807123390. Jeff Foust (2005-09-06). "The hurricane and the vision". The Space Review. 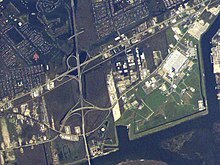 Wikimedia Commons has media related to Michoud Assembly Facility.